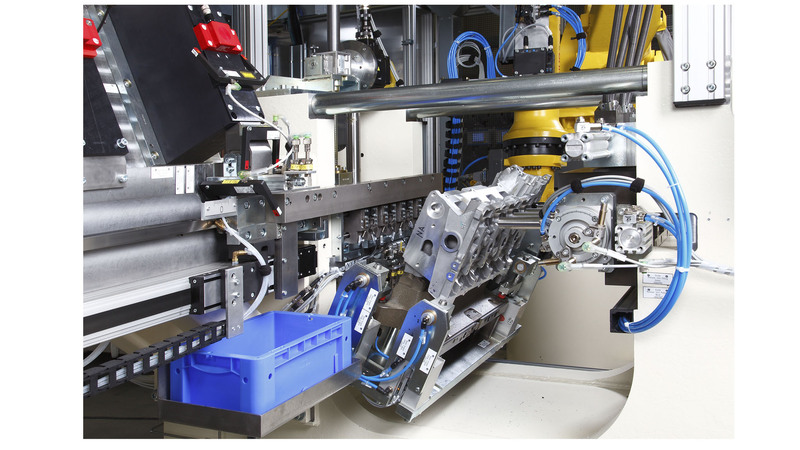 Production-integrated pre-assembly machines are integrated into the material flow of machining assembly lines of cylinder heads, crankcases and other parts of automotive combustion engines. The assembly machine is virtually on a line with the machine tools of the part production. Excluded are pre-assembly systems in the engine assembly operation. Characteristic is the need for subsequent machining manufacturing steps after pre-assembly - or vice versa: the need for pre-assembly before machining can be continued. 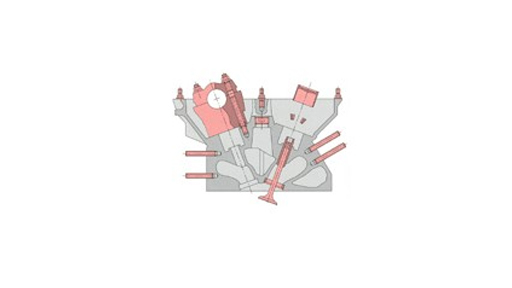 Thus, the cylinder head must be milled flat again after pressing-in valve seat, in order to countervail the distortion caused by pressing-in operation. In case of the crankcase, for example, the crankshaft bearing covers must be mounted before the fine machining of the crankshaft bearings. Typical is also the sealingsm of corner-drilled channels for cooling water and oil by joining balls, bolts, screws or expanders as closure elements with a subsequent leak test.